This pretty, one bedroom cottage, set in a small hamlet a short drive from the fortified and historic town of Villebois Lavalette, has a wealth of period features. Exposed beams and stone walls abound throughout this beautifully restored former haybarn. Well equipped kitchen/breakfast room, cosy sitting room with log burner, upstairs pretty bedroom with double bed and single bed. Ensuite shower room. There is a private garden with heated swimming pool for your exclusive use. Enjoy breakfast on the verandah, sip a pineau by the pool taking in the breathtaking views or enjoy an al fresco evening meal under twinkling starry skies. Relax and unwind in this peaceful country setting. The cottage is perfect for a couple, or small family alike. It's private, heated pool is a real feature and because you have sole use, this makes it a perfect relaxing retreat, to unwind and get away from the hustle and bustle. The setting is rural and the views stunning, often over fields of sunflowers, sometimes corn. The pool area is fenced and gated, and screened from neighbours. One of France's most beautiful villages, Aubeterre-sur-Dronne is a short drive away and has a wealth of restaurants, unusual shops, Sunday market and a popular river beach with small children's play area. We are Barbie and George. We live in the Middle East. We first visited the Dordogne/Charante area of France in 2013 when we visited friends in Aubeterre. As we live in the Middle East, the lush and peaceful countryside proved a huge attraction. Through 'Make France Your Home' we were shown Vesignole. We immediately fell in love with the rustic house, especially the beautiful garden, amazing views and the added bonus of a swimming pool. 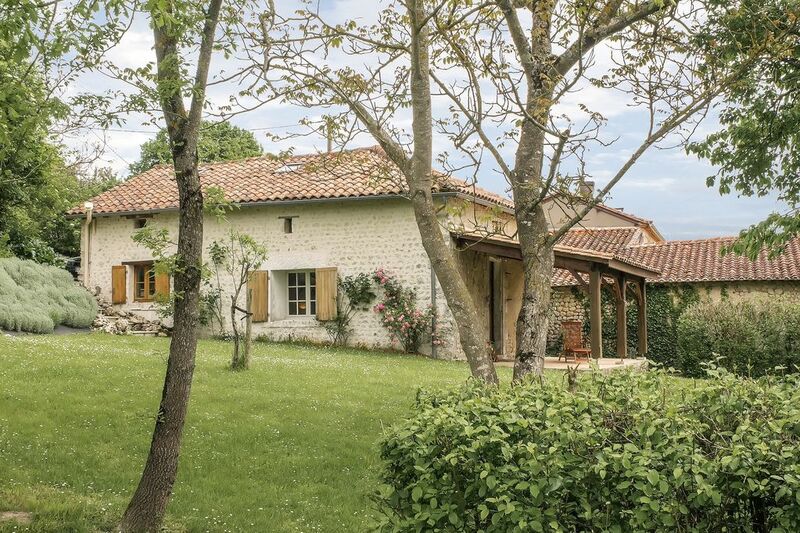 We look forward to many happy trips enjoying the rural environment, visiting the many markets in the surrounding towns and villages, and enjoying the French way of life entertaining friends in this attractive property which we are proud to own. The cottage has it's own new private heated swimming pool. Being on a slope, you can swim or sunbathe on the decking with an uninterrupted view of the Charente countryside. Eat alfresco on the verandah or sip pineau by the pool. The cottage has the benefit of English TV and wifi - although being in the countryside, the wifi can be unreliable. In which case, a visit to the local cafe means you can enjoy a lovely croissant and coffee whilst you connect to your friends. ensuite shower room - shower cubicle, wc, sink. Please note. Access to bathroom and toilet is through the main bedroom. Heated and private. Beautiful views from pool area. Sunloungers provided. Notes on accommodation: A washing machine, iron and ironing board is provided. UK satellite TV with free-view channels and DVD player. Selection of books. Outside: Outdoor covered terrace with BBQ, large table and chairs. Private garden. Private, gated, alarmed and heated 10m x 5m pool for sole use of cottage guests. Two sunbeds outdoor table and chairs with umbrella. Stunning views. Utility Room: cleaning equipment provided including iron and ironing board Cleaning / Towels / Linen / Maid service: The cottage will be cleaned prior to your arrival with bed/s made up for you. Towels and bed linen provided - just bring your own beach/pool towels. We have recently returned from an amazing stay at this beautiful cottage. The location was just perfect, and the pool was the icing on the cake. The cottage itself had everything we needed and more, attention to detail was second to none. We have hired many holiday cottages over the years and I can honestly say this was the best one so far! We hope to come back next year. We visited this cottage once and liked it so much we have been back three more times. It is quite a drive from the Brittany ports, 7 or 8 hours, unless you use the Autoroutes which clips as little time off, but you then miss driving through the countryside, villages and towns. A pleasant drive and more than made up for when you get to Vesignole. The cottage is very clean, well appointed, and comfortably furnished. It also overlooks a small valley with stunning views. Vesignole is all about peace and quiet, with not many neighbouring buildings. Most of the noise you will hear during the day comes from the nearby chickens or birds, and we have even had small dear in the garden. Outside the cottage it was lovely to be able to sit on the verandah area for breakfast or in the evening watching the sunset. The garden is quite large and the swimming pool with paved patio area around it is the icing on the cake. A proper swimming pool and big enough to have a swim. The screen at the rear of the patio adds that little more privacy, although we rarely saw anyone in the gardens of the neighbouring houses and even they are far enough away not to be invasive. If you want a holiday destination with all amenities close at hand go elsewhere because Vesignole will not be for you. It is ideal for that get away from it all relaxation holiday. Locally, there are many very pretty towns and villages, and the local village has a patisserie and very pleasant restaurant. The supermarket is about 3 miles away, so make sure you don’t forget anything when you go there. Beautiful location and views ! We have now stayed at Vesignole twice because we love it so much. The swimming pool is amazing with the most spectacular setting and views! The house is very pretty and everything is catered for. The location is fabulous, in amongst fields of sunflowers but just a short drive to Aubeterre sur drone with its beautiful cobbled streets and restaurants. The children love the kayaking and zip wire tree top adventures. Market day at Chalais is good and Angouleme, Brantome and the coast all within reach for a fabulous day out! Would definitely recommend! The river beach at Aubeterre-sur-Dronne is great for a relaxing swim. There is a bar/restaurant, toilets, diving board and raft to swim to. Here you can also hire bicycles, canoes and kayaks. There are many river and lake beaches in the area. The nearest coastal beach is located at St George de Didonne, about 1hr30 mins away. It has a huge expanse of glorious sandy beach with long walk ways and cycle paths. Royan and beaches of Bordeaux are a little further at 1hr45 mins. The area is easily accessible with Bergerac airport just over an hours drive away or catch the TGV from Paris to Angouleme. Car hire is available at both Angouleme and Bergerac. As we have a rural location, use of a car would be necessary for exploring all that the area has to offer. If you prefer not to drive whilst on holiday, we can arrange transfers to and from the airport. We are close to the borders of the Charente, and Dordogne, so ideally located to reach many places of interest. The local village of Salles Lavalette is a short drive/cycle and has a great restaurant, boulangerie and local produce for sale. Perigueaux with cobbled streets, lovely market square and interesting shops is 40 mins drive, Riberac has a Friday market, shops, restaurants and supermarkets and is 20 mins away. Popular and stylish, Brantôme is approx 40 mins drive and is a must. Close to the Charente/Dordogne border. Beautiful towns and villages to explore with their ancient winding streets, cafés, restaurants and wonderful shops and charming central squares. It's an ideal place for historians, with the medieval treasures of Brantome, Sarlat and Domme together with the cave paintings at Les Eyzies and Lascaux. There are beautiful local markets such as Villebois-Lavalette and numerous restaurants offering excellent French cuisine. Wander through the cobbled streets of Perigueux, the capital of the Périgord Vert, visit the ancient Cathedral or enjoy a meal in one of the fantastic gourmet restaurants. The medieval city of Angoulême has a maze of little streets to explore with an abundance of cafés and restaurants plus the renowned indoor food market. Approximately 25 minutes drive away is Aubeterre-sur-Dronne, one of the most beautiful villages in France. It is a built on a steep hill and boasts an amazing underground church, a pretty village square lined with restaurants and cafés, interesting little shops and boutiques.Vesignole is still a typical French hamlet. The beautiful countryside, together with the peace and tranquility makes it a place to really relax. The people are very friendly and you can step back and enjoy a way of life free from the hustle and bustle of modern day living. However, if you like sport, then there is also plenty of wonderful cycling, canoeing and swimming. It's also an ideal place for historians, with the medieval treasures of Brantome, Sarlat and Domme together with the cave paintings at Les Eyzies and Lascaux. There are beautiful local markets such as Villebois-Lavalette and numerous restaurants offering excellent French cuisine. There really is something for everyone here. Booking Notes: A deposit of 25% is payable upon confirmation of your booking. The balance is payable 8 weeks prior to your arrival date, along with a security deposit which is returned within 2 weeks of your departure. Changeover Day: Changeover day is usually a Thursday. We will consider other days out of the peak school holidays.